You think you know soju? I thought I knew soju. It’s cheap enough in Korea to become easily acquaintable. I can only drink it when I’m in the mood for it. I recently did some more research on soju for an article I wrote for SEOUL Magazine, and I became simultaneously repulsed and intrigued. 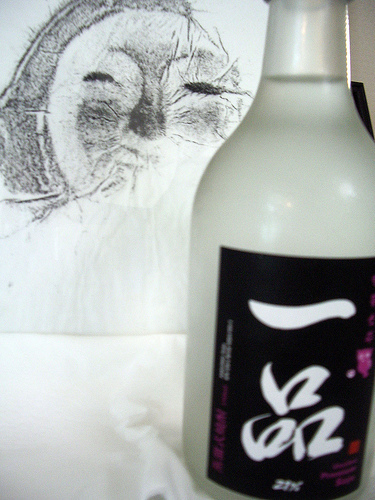 What repulsed me was that most cheap commercial soju — the stuff people usually drink — is not distilled. It’s pure grain alcohol mixed with flavorings and watered down. That explains the hangover factor. Yet the real distilled stuff is more expensive and not as widely available. Most of it comes from the little city of Andong. I perused the liquor section at my local E-Mart, and I saw this bottle of Ilpoom brand Andong soju for around 7,000 won ($7), compared to a bottle of regular soju, which runs for 1,000 won ($1). Also, the Andong soju is 45% alcohol whereas regular soju is around 20-35% alcohol. I heard that Andong soju has a kick. As a result, it sat in the refrigerator for a while, waiting for that special occasion when I would have the inkling for a stiff drink. That inkling occurred last weekend. I opened it and poured it into a traditional soju glass (not a shot glass). The aroma was flowery and clean. My goodness. It’s not that bad. The taste was clean and complex. It was a little sweet — not sugary sweet — like a mild fruit with a buttery finish. It had more similarities to sake than it did to green bottle soju. It was a lot stronger than sake, and I think it would also be useful in cooking. Now that I’m learning to like the real stuff, I’m gonna have to take a trip to Andong to try it straight from the source. This is still one of my favorite sojus. I can’t stand the green bottle crap. It’s not real soju. It’s pure grain alcohol distilled from whatever cheap source possible. Then it’s mixed with water and artificial flavorings. In the 1960s there was a rice shortage. Dictator Park Chung Hee banned rice from being used to make liquor–except in the Andong region. I guess they forgot about it because that ban wasn’t lifted until 1999. By then you had a generation or two brought up on the green bottle swill. Modern Koreans won’t go back, and many don’t appreciate, the original stuff. I say that, but it’s changing. There’s a small movement to revive traditional liquors. I still enjoy a good Andong soju. Some people love Hwayo, but I’m not a big fan of the guy behind it. It’s way overpriced. Their barrel aged stuff costs more INSIDE KOREA than imported single malt Scotch. It’s good, but it’s not THAT good. If you go to Andong for the soju, go to the highly educational SOJU MUSEUM! I took my family there on their tour of Korea. There was a guide that talked to them in English. There are displays explaining the soju making process, as well as plastic food displays of all the traditional meals of Korea. At the end of the tour, they even gave us a free shot of Andong Soju! I take Andong Soju back for my friends in the United States when I travel. It can be purchased in the city and grocery stores with really nice collectable bottles. Oh yeah… it’s on the list of places to go. I saw the Soju Museum on Thirsty Traveler. Have you ever been to the surreal experience called the Kimchi Museum? Ooh – interesting entry. I’ll have to try this high quality soju. I like sake a LOT more than soju. Soju is not associated with “tasty” for me at all. That’s probably in part because I had that awful night of spewing really cheap soju on the sidewalk my first weekend here. I think it’s pretty much mandatory to go through that. Right now I only drink soju mixed with something else. Also – the Kimchi Museum is indeed surreal. However, I think they present the information quite well for the most part. I took family there recently and there was an English guide available. Grain or Ethyl Alcohol is distilled from a source of grain or fruit at some point. Therefore, Soju is distilled and later the proof is cut (diluted with flavorings, probably sugar and water) to a desired point. This is the same case with any distilled spirit regardless of quality. I have to say I had the pleasure of trying the Andong soju recently. Taste is pretty strong but you could def notice the difference between other soju and Andong soju. No hangovers.. ^.^ Loved the experience. Yeah, it’s a lot stronger but tastes cleaner. I’m getting a lot more hooked on it the more I try it. Give me a bottle of Cham E-Seul any day..